Cedar Spring Farm - Located in Fluvanna County with close proximity to the historic town of Palmyra, this wonderful 15.48 acre horse farm features board-fenced pasture, expansive mature hardwoods, chicken coop, 24x14 equipment shed, & 4-stall, center aisle barn. Built to stand the test of time, the main house adorns cypress siding with a slate roof. Tranquility and privacy only 20 minutes from downtown. Lot B-05 features a level homesite that is ready for your dream home. Lot also offers easy access to our trail system. Bundoran Farm is a 2,300 acre conservation based community located just 15 minutes south of Charlottesville. Gorgeous panoramic views from this 13 AC homestead will take your breath away! You won't want to leave the beauty and calm this Albemarle County property offers. Loved for generations, this wonderful family farm is waiting for new owner. Renovate the 1920 farmhouse to make habitable or build your dream home, farm, artist studio, or winery. Upper field is truly stunning site. 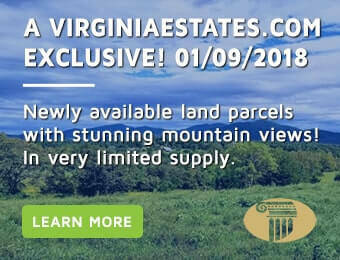 A very Unique and special home in the Desirable Somerset Virginia is offered for sale for the first time. Beautiful views of neighboring estates fromevery window, this well maintained home is set on 11 pastoral acres. Three board fenced pasture and timber peg, custom built barn are ready foryour horses or livestock. HORSE potential with this unique country home near Zion Crossroads! There are 25 acres of maturing loblolly pines in the rear, but around the old homeplace, plenty of open acreage to install fencing and a barn. This old c.
Private, wooded homesite with potential for nice, protected pastoral view. Great trail access as well. Bundoran Farm is a 2,300 acre conservation based community located just 15 minutes south of Charlottesville. A full working farm with livestock, orchard, and vineyard that are maintained through the association giving owners a taste of the farm lifestyle without the responsibility of maintenance.